Direction: Boil all ingredients with proportional pork in 8 bowls of water and simmer for 2 hours on low heat. Add small amount of salt to enhance the taste. If use electric cooker, simmer with 5 bowls of water for 6 hours on low heat. Storage: Keep in a dry condition. 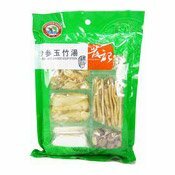 Ingredients: Ginseng, Yam, Jade Bamboo, Barley, Date, Lotus Seed, Cassava, Preservatives (E221). Simply enter your details below and we will send you an e-mail when “Ginseng Jade Bamboo Soup Stock (兄弟沙參玉竹湯)” is back in stock!